Egypt has decided to dispatch her heroes, the disciples of Pharaoh and the sons of Islam and they will cleanse the land of Palestine....There will be no peace on Israel's border because we demand vengeance, and vengeance is Israel's death. These "heroes" were Arab terrorists, or fedayeen ("one who sacrifices himself"), trained and equipped by Egyptian Intelligence to engage in hostile action on the border and infiltrate Israel to commit acts of sabotage and murder. 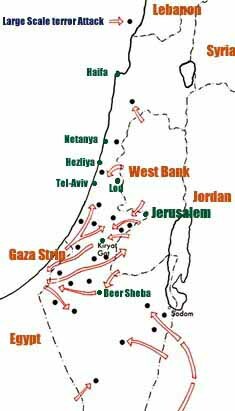 The fedayeen operated mainly from bases in Jordan, so that Jordan would bear the brunt of Israel's retaliation, which inevitably followed. The terrorist attacks violated the armistice agreement provision that prohibited the initiation of hostilities by paramilitary forces; nevertheless, it was Israel that was condemned by the UN Security Council for its counterattacks.